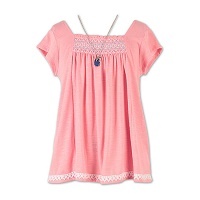 Dress it up, or dress it down with kids' T-shirts for every occasion. Kids want to dress just as stylishly as adults do. They want to express their interests and personalities through their clothing. Parents want to make sure that clothing is not just stylish but versatile. Kids' T-shirts come in every color, and some even have sparkles and fun sayings. Look for a T-shirt in bold solid colors or an all-over print. Try a plain white T-shirt under a sweater vest or cardigan to give a kid cool style cred while still dressing up for a special occasion. Both girls and boys love graphic tees. Kids' T-shirts from JCPenney with movie, television, and video game characters are extremely popular. With the explosion of comic book films, superhero clothing is one trend that isn't going to slow down anytime soon. Kids can unleash their everyday inner superhero everywhere they go with these on-trend tees. Look for graphic T-shirts that announce kids' favorite things like dinosaurs, pizza, unicorns, and rainbows or find a shirt with popular cartoon characters, including retro styles. JCPenney has a T-shirt to suit every kid! When buying kids' T-shirts, comfort is one of the most important elements. Children run, jump and climb, placing a heavy demand on their clothing. Their clothing should provide ease of movement during play, warmth during fall and winter, and keep them cool during spring and summer. With our kids' T-shirts, you'll find comfort, durability and style! 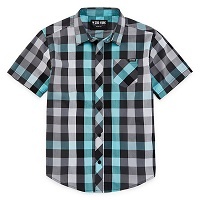 JCPenney boasts an excellent selection of T-shirts for boys and T-shirts for girls made with various fabrics, including one of the most versatile shirt materials, cotton. Cotton T-shirts provide the perfect combination of form and function. Look for shirts with flat seams and a printed label rather than a sewn-in tag to avoid an itchy annoyance to kids who are sensitive. 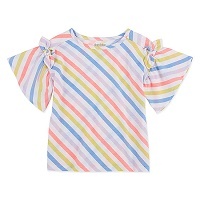 JCPenney has shirts that can withstand a rough session on the playground, food stains from lunch, and much more. What about washing and drying? You'll find our shirts hold up against numerous washing and drying cycles, making them a great investment for your kid's wardrobe. Take a look at all of our kids' shirts in the kids' department. 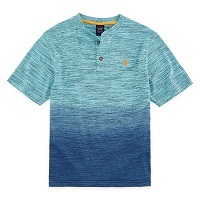 The classic short-sleeved T-shirt has long been a wardrobe staple and can be found on virtually every kid. Find trendy styles in solids, stripes, or prints along with graphics, sparkles, or other fun embellishments. 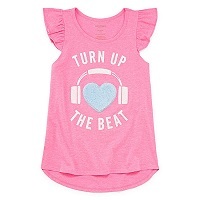 JCPenney's short-sleeved kids' T-shirts are also available in plus or husky sizes so that all kids can wear their favorite styles, characters, and colors. Long-sleeved T-shirts allow kids to keep the soft comfort and casual style they are used to for cooler weather. These are the same classic graphic and printed tees, just with long sleeves perfect for fall weather. Look for them in plus and husky sizes, too. Whatever sort of kids' T-shirt you are looking for, JCPenney has it.